The RIDE (blue buses with fixed-route services). For day-to-day information, schedules, fares, etc., contact the Sitka Tribe of Alaska’s transit line at 747-7103 from 8 a.m. to 4:30 p.m. on Monday through Friday. You can leave a message at other times and days. You also can send an email to Ssmith@sitkatribe-nsn.gov for assistance. Care-A-Van (white buses with door-to-door services). For information or to request or reserve a ride, call the Swan Lake Senior Center at 747-8617 from 8 a.m. to 4:30 p.m. Monday through Friday (from 5-9 p.m. on Monday through Friday, call 738-1333 to request a ride). 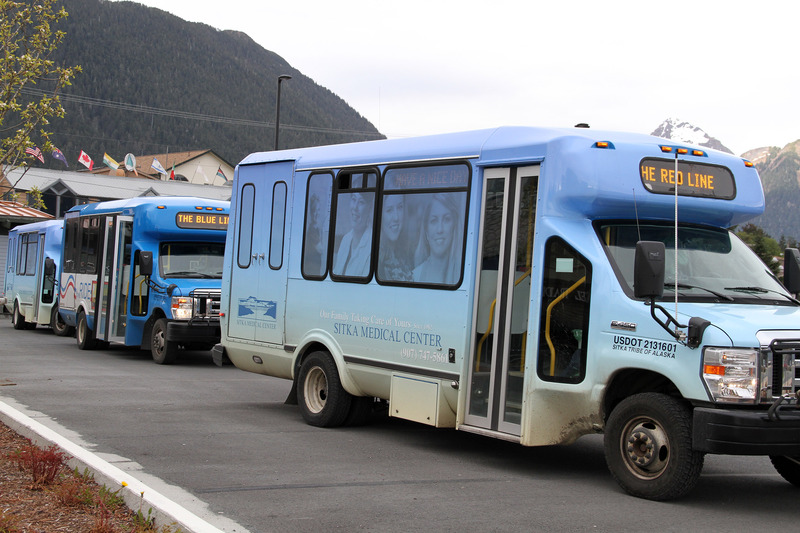 For other information about public transit in Sitka, you can email Center for Community at transit@cfc.org, or call 966-4232 and leave a message. If you have a complaint about services on the RIDE’s blue buses, please contact Sitka Tribe as described above. If you have a complaint about services on the Care-A-Van’s white buses, please contact the Swan Lake Senior Center as described above. If you have other complaints or questions, you can contact Center for Community as described above. You also have a right to appeal to Center for Community about any grievance with either of our public transit services, if you are not satisfied with the response to your concern that you received from the two other partners who provide the day to day services. Please use the same methods — email or phone — as described above, to contact Center for Community. I’m new to town. I am staying on Etolin Way and am walking to SEARHC where I work. I Ann wondering if there is a bus I can take to get there instead. I see the green line goes there, but I am not a senior or disabled. If I can take the bus, please tell me where I can catch it. The blue the RIDE buses are our public transit buses, open to all ages and abilities. The white Care-A-Van buses are the ones for seniors and disabled. The RIDE’s closest pick-up point to Etolin Way is at the Crescent Harbor parking lot, and the Green Line stops there at 45 and 15 minutes after the hour (Green Line makes two runs in an hour, while the Blue and Red lines make one trip an hour). All of the buses meet at Crescent Harbor at 45 minutes after the hour, which allows for free transfers. The Blue and Red lines also connect at Sitka High School for more transfers. The one-way fare for adults is $2, and there are monthly passes and punchcards you can buy to extend your money a bit.